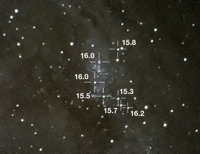 Selected Deep Sky Object images. Unless otherwise indicated, images were taken with a Nikon D7200 DSLR on a Meade 12" LX600 telescope. Click a thumbnail to see a larger version. There is also a Galaxy Supernova Astrophotography album.